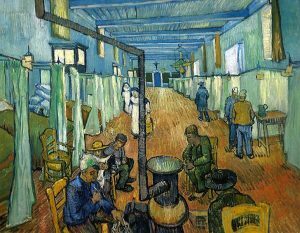 Vincent van Gogh, “Ward in the Hospital in Arles” (1889) – Rethink. That red floor, turbulent with strokes of light and shadow, menaces my vision. 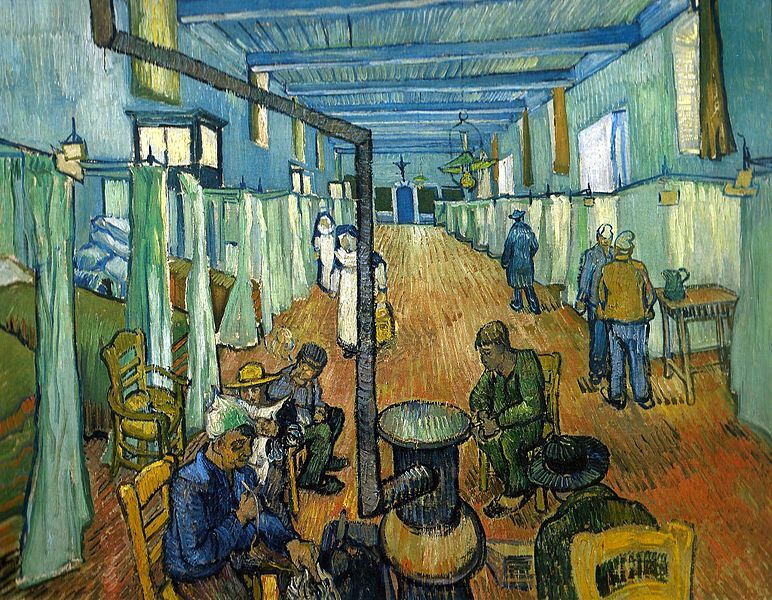 This is a hospital ward; surely one can imagine recuperation, wellness. I think of times I’ve hurt and made things worse, times I’ve healed and made things better, and I know I could not have begun healing by envisioning such a terrible path. Still, the initial shock fades away as I attend to the light from windows, the shadows of human beings, the warmth of the stove. The floor holds these also. The windows are too high, providing a disinterested, inhuman sunshine, but it is sun all the same. The shadows, with their motion and irregularity, paint over that garish blood red. They don’t whiten it like the sun, creating blinding spots, but dull it, making it seem manageable. To the left of the stove dominating the foreground, patches of yellow and orange, actual warmth. The scariest part of treatment is the unknown. Not so much the terror that things can get worse, but the terror that I will make it worse. Fighting for survival seems to many of us the deepest sort of courage, even if we reject it as the highest. — Won’t every animal try and save itself? Aren’t there causes for which we must sacrifice? All the same, I want to know I would never quit, that I can see things through. — A group huddles around the stove in the center and foreground of the painting. They are nearly all downcast, none in communication. The viewer might think herself standing near them while they sit. She has just entered, and the stove’s apparatus has taken her by surprise. It features a pipe that nearly cleaves the picture in two, separating one side of the room with nuns and a row of visibly empty beds from the right side of the room. That side features a row where every partition for the beds is closed. Privacy is ghostly when one wants to know how to heal. It’s like the path isn’t even there: who can show the way? Who can show you your own resolve, your own capability? Those shrouded beds already have eternal rest. The left side: two nuns, one holding a bucket; full beds revealed, with plenty of pillows and blankets; an empty chair near the stove invites. Is this truly where recovery starts? It looks like no true life at all, only the most minimal, temporary, disposable arrangement. This is all a dark joke, right? Right across from our viewer, the vanishing point of the painting, a door with a large crucifix above it. Salvation, so far away. This is a sick place, a mockery of nature. These people mimic people who actually live in the world, the pale ghostly green of the curtains mimics plant life, and the terrible red floor and purple roof call to mind a massive, trembling sunset. All these thoughts, of course, are unreal. The stove and those around it are seen as if from above. It’s almost like van Gogh painted this on a stepladder, his eyes meeting where the floor, in the distance, meets the door with the crucifix. Our viewer has to confront not only the unreality of wellness, but the unreality of her doubt. How she’s taking in the scene is everything. On the one hand, she’s bearing witness to the afterlife, where we congregate outside of conventional society and nature, between life and death, with God perhaps watching. The afterlife is Purgatory, and therefore both Heaven and Hell. On the other hand, she’s here, in the hospital, and a decision must be made. She has seen this as an unflinching, unwell place. But a puff of smoke rises from one smoker, and in the air hang these green lamps, almost like birds from another world. In the midst of horror, we hope to choose hope.